A slightly pointless exercise in many ways but a debate in the pub with a Spurs fan got me thinking about a fantasy football team made up of ex-reds who are still playing. In recent seasons Spurs have faced more of their own ex-players than any other team, according to the bloke in the pub, and he was able to name a handy XI which included the likes of Crouch, Carrick, Berbatov and Danny Murphy. It was a commonly held view that a move away from United was a step down but is that true in all cases? The reds certainly have excellent former players still at the top of their games with Cristiano Ronaldo the most notable while Diego Forlan, Gerald Pique and Guiseppe Rossi have also done remarkably well since leaving Old Trafford. David Beckham won the title at Real Madrid after leaving United and is still playing today, albeit in the United States. 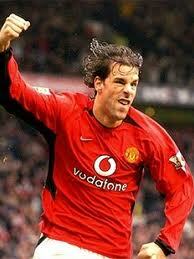 Ruud Van Nistlerooy is now at Malaga via Hamburg, Louis Saha recently moved from Everton to high flying Spurs. There is certainly no shortage of ex-United talent still playing at the highest level. So what kind of fantasy XI could we make out of these ex-reds. During my chat with the Spurs fan in the pub I named Tim Howard as my goalkeeper. Ben Foster was the only significant challenger to Tim that I could think of at the time but I opted for the Everton keeper who has been a vital part of his team's solidity since his move. Foster, by comparison was relegated last season with Birmingham and appears to have regressed since his excellent season on loan at Watford. Since graduating from the Old Trafford youth academy Danny Higginbotham, Phil Bardsley and Ryan Shawcross have all enjoyed solid careers in the Premier League. Another graduate, Danny Simpson is currently making a name for himself at Newcastle United. The back four I have chosen however consists of O'Shea at right back; Brown and Pique in the centre and Heinze at left back. The selection of Pique needs no explanation. Selecting Heinze was easy too. He is currently a regular in the Roma defence, having played for Real Madrid and Marseille since leaving United. The experience of Wes Brown and John O'Shea was also impossible to ignore; both having played their part in United's Premier League and European campaigns as recently as last season. They continue to perform well for Sunderland under Martin O'Neill. In choosing the midfield the first dilemma was what formation to select. I have opted for 4-3-3 - to make space for the wealth of forward talent available - and immediately selected David Beckham. In the past five seasons the reds have sold relatively few midfield players with Owen Hargreaves being the most notable departure. When fit, Hargreaves was excellent. Unfortunately he has rarely been fit and has featured only once or twice for his new club Man City. Even so, for the purposes of this exercise we will consider him fit. The recently departed Darron Gibson is another in contention as are Gabriel Obertan, Kieron Richardson and Phil Neville, who I am considering a midfielder rather that a defender. With Beckham already selected there are only two places up for grabs. As Everton captain, Phil Neville is worthy of one of those places. I am also selecting Hargreaves on reputation rather than current achievements. Perhaps I have forgotten someone but even if I have I think that this XI would give anyone a game (fitness permitting). It might also suggest that, in a few cases at least, leaving Old Trafford is not necessarily a step down. 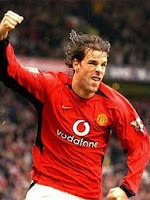 i dont understand how could u miss RvN while having Beckham in your team? If u have the best crosser on earth then surely u must have the best predator in the box.